Background Hypothermia, defined as a core body temperature less than 36°C (96.8°F), is a relatively common occurrence in the unwarmed surgical patient. A mild degree of perioperative hypothermia can be associated with significant morbidity and mortality. A threefold increase in the frequency of surgical site infections is reported in colorectal surgery patients who experience perioperative hypothermia. As part of the Surgical Care Improvement Project, guidelines aim to decrease the incidence of this complication. Methods We review the physiology of temperature regulation, mechanisms of hypothermia, effects of anesthetics on thermoregulation, and consequences of hypothermia and summarize recent recommendations for maintaining perioperative normothermia. Results Evidence suggests that prewarming for a minimum of 30 minutes may reduce the risk of subsequent hypothermia. Conclusions Monitoring of body temperature and avoidance of unintended perioperative hypothermia through active and passive warming measures are the keys to preventing its complications. The operating room (OR) is generally not considered an extreme environment; however, it can be for many patients. As homeothermic (warm-blooded) animals, humans require near constant internal body temperatures to maintain optimal function of multiple organs and systems. ORs are typically kept below 23°C (73.4°F); this is the temperature required to maintain normothermia for all but the shortest procedures.1 Surgical patients consistently comment on the cold temperature in the OR. Room temperature is the single most critical factor influencing actual heat loss because the temperature gradient determines this rate. Most OR personnel find the temperatures required for normothermia uncomfortably warm, however, and lower OR temperatures are the norm. Surgeons are particularly vulnerable to warm ORs because of the high level of stress during surgery and because they must wear multiple layers of clothing, including sterile gowns and lead aprons. Physicians and other staff may perspire into a surgical incision if the OR is not kept cool. Warm temperatures may also impair the performance of OR personnel by decreasing their vigilance. The Surgical Care Improvement Project (SCIP) has focused institutional efforts on preventing hypothermic complications during and after surgery. Compliance with SCIP measures is increasing nationally.11 For example, during the most recent quarters in 2010, Ochsner Medical Center in New Orleans had 100% compliance with SCIP INF 10, the application of warming devices or perioperative normothermia (Ochsner internal audit presented to Performance Improvement Committee, October 2010). An understanding of the basic science of thermal regulation, the mechanisms of hypothermia in the perioperative setting, and the adverse effects of UPH is essential for personnel providing anesthesia care. The American Society of Anesthesiologists' standards for basic anesthetic monitoring state, “Every patient receiving anesthesia shall have temperature monitored when clinically significant changes in body temperature are intended, anticipated, or suspected.”12 This guideline does not define the means of temperature monitoring, when to monitor, or the duration of monitoring, leading to inconsistency in patient care and wide variation in clinical practice. Guidelines from the American Society of Perianesthesia Nurses (ASPAN) in Table 1 provide evidence-based recommendations for temperature monitoring. Near-core temperatures obtained from axillary, rectal, bladder (with low urine flow), and oral measurements are more commonly used in regional anesthesia cases and in the perioperative period. These measurements are generally easier to obtain but are affected by external influences (ambient temperature) and thermoregulatory functions (regional skin blood flow) of the body. Although this concept makes sense when dealing with axillary and oral temperature measurements, the discrepancies with rectal and bladder temperatures are not as obvious. Rectal temperatures normally correlate very closely with core temperatures.14,15 However, during cases of heat stroke and malignant hyperthermia, these measures lag behind.16,17 Additionally, during cardiopulmonary bypass, the rectal temperature lags behind true core temperature and is thus considered a near-core temperature in deliberately cooled patients. Thus, one must exercise caution in using rectal temperature measurements. Bladder temperature is equal to pulmonary artery (core) temperature when urine flow is high but approximates rectal temperature when urine flow is low.18 Because of the dependence on urine flow, bladder temperature is also considered a near-core measure. Thus, each of these measures is limited in the ability to reflect core temperature. The optimal source for monitoring temperature in the preoperative, intraoperative, and postoperative periods is an area of debate, typically depending on patient age. In the preoperative period, oral temperature is most commonly used for adults, oral or axillary temperature is used for pediatric patients, and axillary measurements are used for neonates. With these issues in mind, either core or near-core temperatures may be used in the perioperative period after a risk versus benefits assessment has been performed and with the understanding that clinical circumstances may require an additional method. All surfaces that exist at a temperature above absolute zero radiate heat (infrared radiation). All surrounding surfaces absorb this radiated heat. Therefore, the patient radiates heat into the surrounding environment. Radiation likely represents the major type of heat loss during surgery. Normally, a thin layer of still air adjacent to the skin acts as an insulator and limits conductive heat loss to surrounding air molecules. When air currents disrupt this layer, the insulating properties are markedly diminished and heat loss increases. This is referred to as convection and is the basis for the concept of the wind chill factor. In non-OR hospital settings, room air is typically exchanged 4 times per hour, while in typical ORs the air exchange occurs 15 times per hour. This minimally perceptive movement of air throughout the OR makes these rooms feel subjectively colder. Surgical drapes act as thermal insulators to minimize convective heat loss. Despite draping, convective heat loss is considered the second most significant source of heat loss in the OR. Conduction is the transmission of heat through a conducting medium without perceptible motion of the medium. The rate of heat transfer depends on the temperature difference between the 2 media and the heat conductivity of the material. Conduction plays a minor role in heat loss during surgery because the patient is in direct contact with the foam insulating mattress on the OR table. Under normal conditions, human thermoregulatory systems maintain a constant body temperature within a few tenths of a degree centigrade; normal body temperature is approximately 37°C (98.6°F). In the OR, however, a combination of altered thermoregulatory mechanisms and cooler room temperatures typically causes a decrease in core temperature. Hypothermia, defined as a core temperature less than 36°C (96.8°F), is a relatively common occurrence among surgical patients, with an incidence of up to 20%.2 It is not uncommon for a relatively healthy patient to experience a decrease in core temperature of 0.5-1.5°C (0.9-2.7°F)23 in the first hour of a procedure. A system of afferent thermal sensing, central regulation, and efferent responses constitutes physiologic thermoregulation. In hypothermia, afferent thermal sensing arises from cold-sensitive cells located in the brain, spinal cord, deep abdominal tissue, thoracic tissue, and skin surface.24 The hypothalamus and to a lesser degree the spinal cord centrally regulate body temperature. The efferent response to hypothermia is manifested primarily through behavioral modification but also through vasoconstriction and shivering in adults. Neonates also demonstrate nonshivering thermogenesis, which is discussed in more detail later. Under normal circumstances, body temperature is well maintained by regulating blood flow through arteriovenous shunts located in the skin's surface. This blood flow may account for up to 10% of the cardiac output, and vasoconstriction may increase mean arterial blood pressure by approximately 15 mmHg.25 Anesthetics have a profound effect on thermoregulatory mechanisms. General anesthetics inhibit cold-induced vasoconstriction, which promotes the development of patient hypothermia in the presence of a cold environment. The body's heat is not uniformly distributed. Rather, heat is normally concentrated in the core region, mainly the head and truncal areas, while the periphery remains cooler. Interestingly, as the body is stressed by cooler OR temperatures and the vasodilatory effects of a general anesthetic occur because of a loss of sympathetic tone, the heat in the core area flows outward towards the periphery23 (Figure 1). This shift results in a rapid core temperature decrease of 0.5-1.5°C (0.9-2.7°F) measured within the first hour of surgery. This redistribution hypothermia is not actual heat loss but rather a shift in thermal energy from the core to the periphery, occurring as a result of the vasodilation properties of general anesthetics. Subsequently, the warmer periphery caused by general anesthetics also results in a greater risk of the patient losing heat into the OR environment. Redistribution of core heat during general anesthesia. Characteristic pattern of temperature change seen with general anesthesia. Class I: The benefit far outweighs the risk, and the recommendation should be performed or administered. Class IIa: The benefit outweighs the risk, and it is reasonable to perform or administer the recommendation. Class IIb: The benefit is equal to the risk, and it is not unreasonable to perform or administer the recommendation. Class III: The risk outweighs the benefit, and the recommendation should not be performed or administered. Level A: Evidence from multiple randomized trials or meta-analyses evaluating multiple (3-5) populations, with general consistency of direction and magnitude of effect. Level B: Evidence from single randomized trials or nonrandomized studies evaluating limited (2-3) populations. Level C: Evidence from case studies, standards of care, or expert opinion involving very limited (1-2) populations. Table 2 presents the ASPAN list of risk factors for UPH. Unfortunately, none of the identified risk factors is supported by strong evidence, suggesting that further research is needed in this area. These factors imply correlation but not necessarily causation; thus, a patient may have risk factors and not develop hypothermia. Hopefully through identification of susceptible patients during the preoperative assessment, strategies may be developed to help ensure normothermic conditions during the perioperative period. In the OR, the initial decrease in core temperature results from the redistribution of heat to the periphery. Prewarming in the preoperative area, when applied for at least 30 minutes, may prevent redistribution of body heat and resultant hypothermia.38 Forced air warmers are one of the most effective means of warming a patient and are best used preoperatively and intraoperatively to prevent UPH. These warmers work better intraoperatively when the patient's periphery is vasodilated.6 Without prewarming, however, intraoperative warming techniques, including those employing forced air warming technology throughout the case, still fail to eliminate the initial fall in temperature. Other warming modalities aim to prevent radiant heat transfer; they include water blankets and warmed cotton blankets. Conventional water mattresses or blankets by themselves have been consistently reported to be nearly ineffective.39 This ineffectiveness may be a result of the small surface area (when compared to forced air blankets) and the minimal amount of heat lost into the foam insulation present on most OR tables. Additionally, the risk for tissue damage is increased by the decreased local perfusion on the backs of patients in the supine position. This scenario may result in tissue damage in cases even when the water temperature does not exceed 40°C (104°F).40 More recent has been the development of circulating-water garments that increase the warmed surface area and materials that facilitate conduction.41,42 One layer of cotton blankets can decrease heat loss by approximately 30%. Additional layers do not provide very much additional insulation. Heat loss from administration of cold intravenous fluids also contributes to hypothermia. Fluid warmers are commonly used in the OR and are recommended whenever blood or large amounts of intravenous fluid are administered. They are not recommended for patient rewarming because the fluid temperature cannot substantially exceed the patient's body temperature without causing hemolysis, thereby materially limiting warming effectiveness. Initially, warming of inspired gases was considered to be an important component in maintaining normothermia. The dry gases are cold and thus represent a potential source of heat loss for patients receiving general anesthetics. However, on further review researchers noted that little heat is actually lost via respiration and that active airway heating and humidification minimally influence core temperature.26 This finding has led to the elimination of heated anesthesia circuits in contemporary practice. Although therapeutic hypothermia has recently demonstrated benefits, for the vast majority of surgical patients, UPH has long been associated with increased morbidity, mortality, and expense. One of the most important causes of morbidity associated with hypothermia in patients is SSIs. Several mechanisms for hypothermia-related susceptibility to SSIs have been identified. Cooler temperatures may directly impair neutrophil function. Hypothermia may also trigger thermoregulatory vasoconstriction; the consequent reduction in cutaneous blood flow leads to subcutaneous tissue hypoxia and failure of humoral immune defense systems to reach target areas to fight infection.58,59 Hypothermia is associated with a threefold increase in SSIs in colon resections3 and with a significant increase of infection in patients undergoing cholecystectomy.60 Considering all of the complications that may be affected by anesthetics, wound infections are likely the most significant cause of morbidity, greater than all other anesthetic complications combined.61 It is estimated that SSIs increase postoperative hospitalization by an average of 4 days and result in an increased attributable cost of $8,00062 to $25,000 (Ochsner estimates from the Infection Control Department, calendar year 2010) for each patient. Research also demonstrates that surgical patients with cardiovascular disease who are hypothermic are three times more likely to have adverse myocardial outcomes than their normothermic counterparts.4 Perioperative hypothermia elevates blood pressure, heart rate, and plasma catecholamine concentrations (principally norepinephrine levels, which may be increased fivefold over baseline,63 contributing to patient discomfort64 in addition to cardiovascular risk in susceptible populations. Hypothermia also shifts the oxyhemoglobin dissociation curve to the left, which increases oxygen binding to hemoglobin, thus reducing available oxygen for tissues. This combination of increased myocardial oxygen demand (hypertension and tachycardia) and decreased myocardial oxygen supply (shorter diastolic filling time and increased hemoglobin affinity for oxygen) may shift the myocardial oxygen balance into a net deficit, resulting in ischemia. Though some authors argue that normothermia may be difficult to attain and requires significant personnel, equipment, and time costs,3,86,87 the forced air warmer disposable blanket is a one-time cost, usually less than $10.88 The use of such devices requires minimal training and time for personnel to implement appropriately. Standardization of warming procedures can decrease the incidence of UPH89 and thus should mitigate the unexpected delays in discharge from the PACU resulting from hypothermia. These delays may result in the OR suites being placed on hold until a PACU bed becomes available. OR costs are approximately $1,600/hour (personal communication with Associate Vice President of Perioperative Services, Ochsner Clinic Foundation, New Orleans, LA, January 2010), and therefore any such delays have substantive financial impact. The question of exactly which measure of hypothermia is the most important to track has yet to be answered. Is it the nadir, the mean, the time temperature integral (a measure of cumulative hypothermic time),90 or the initial PACU temperature? This question has been brought to light by Lehtinen et al91 using a nested, matched, case-control study to determine if hypothermia was an independent risk factor for SSI in gastrointestinal (GI) surgeries. Use of SCIP measures showed no independent association between perioperative hypothermia and SSIs. The researchers concluded, “Pay for performance measures focusing on perioperative normothermia may be of limited value in preventing SSI after GI surgery” and recommended further studies. In the future, use of larger national electronic databases, such as those of the Multicenter Perioperative Outcomes Group and the Anesthesia Quality Institute, may be helpful in determining which measures are most pertinent. Although the majority of literature on hypothermia concerns the adult population, pediatric patients undergoing surgery are even more susceptible to UPH. This susceptibility results from a combination of decreased heat production and increased heat loss during surgery, both of which occur to a greater degree in children than in adults. Pediatric patients undergoing general anesthesia experience a 20% decrease in metabolic rate,93 which is similar to the decrease seen in the adult population.94 Additionally, approximately half of the oxygen consumption and concomitant heat generation in neonates can be attributed to the work of respiration.95 Most pediatric patients undergo general anesthesia where mechanical ventilation is partially or completely provided by the anesthesia team, so that very little heat is generated from the work of breathing. Other contributors to increased risk of UPH are central thermoregulatory inhibition and redistribution of heat within the body, which are similar to those that occur in adults; however, the slopes of each phase are steeper in the younger age groups.96 One adaptation specific to neonates that is helpful in maintaining normothermia is nonshivering thermogenesis,97 a metabolic process that occurs in brown fat. 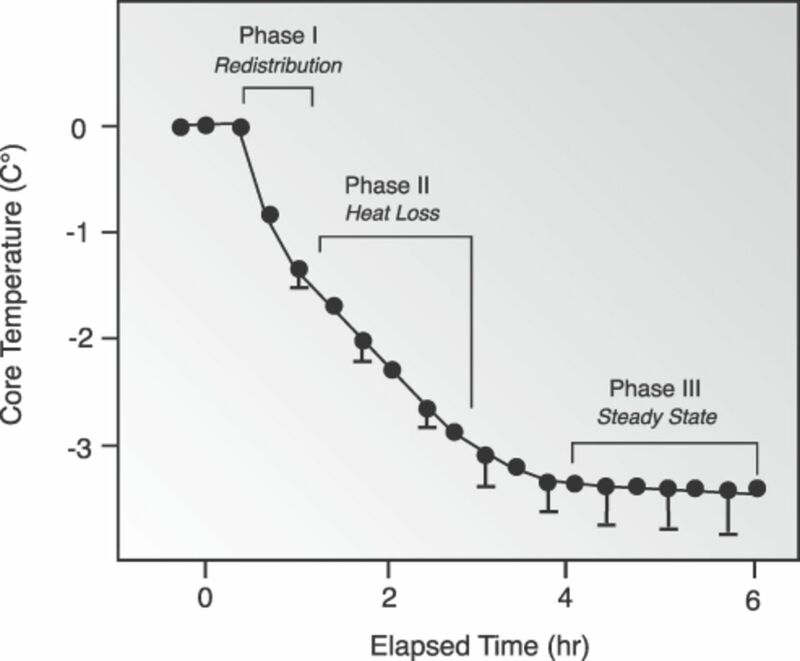 This is reflected in the phase III rewarming slope that is unique to neonates (Figure 3). Characteristic temperature change at various ages. Factors that result in greater transmittance of heat to the environment in pediatric patients also predispose them to UPH. Infants have a greater surface-area-to-volume ratio98 compared to adults. Also, infants have less insulating subcutaneous adipose tissue. Both of these factors result in increased thermal conductance and proportionally more metabolic heat loss through the skin in the youngest patients. 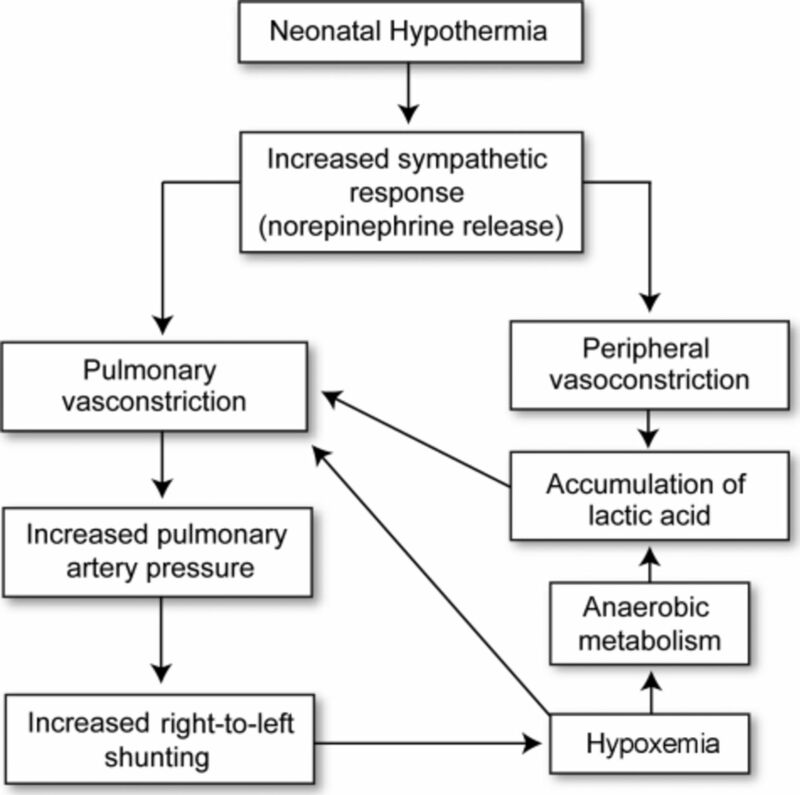 Physiologic changes associated with hypothermia in the neonate. UPH is a common occurrence in the unwarmed surgical patient and is associated with significant morbidity and mortality. Monitoring of body temperature and avoidance of UPH through active and passive warming measures are the keys to preventing its complications that may include surgical site infection, delayed wound healing, adverse myocardial outcome, and increased bleeding. Uniform implementation of evidence-based perioperative warming guidelines can be expected to reduce adverse outcomes and improve patient satisfaction, although prospective validation of SCIP measure optimization has not yet convincingly proven causality. This article meets the Accreditation Council for Graduate Medical Education competencies for Patient Care and Medical Knowledge. (1971) Operating room temperature and the anesthetized, paralyzed patient. Arch Surg 102(2):95–97, pmid:4250862. (2008) Physiology of thermoregulation. Best Pract Res Clin Anaesthesiol 22(4):627–644, pmid:19137807. (1996) Perioperative normothermia to reduce the incidence of surgical-wound infection and shorten hospitalization. Study of Wound Infection and Temperature Group. N Engl J Med 334(19):1209–1215, pmid:8606715. (1997) Perioperative maintenance of normothermia reduces the incidence of morbid cardiac events. A randomized clinical trial. JAMA 277(14):1127–1134, pmid:9087467. (1987) Incidence and effect of hypothermia in seriously injured patients. J Trauma 27(9):1014–1018, pmid:3656463. (1996) Mild hypothermia increases blood loss and transfusion requirements during total hip arthroplasty. Lancet 347(8997):289–292, pmid:8569362. (1997) Perioperative fever. Acta Anaesthesiol Scand Suppl 111:325–328, pmid:9421064. (1989) Effect of preoperative normothermia on postoperative protein metabolism in elderly patients undergoing hip arthroplasty. Br J Anaesth 63(3):276–282, pmid:2803885. (1993) The threshold for thermoregulatory vasoconstriction during nitrous oxide/isoflurane anesthesia is lower in elderly than in young patients. Anesthesiology 79(3):465–469, pmid:8363070. (1999) Hypothermia in trauma patients. J Am Coll Surg 188(6):685–696, pmid:10359364. (2010) Accountability measures—using measurement to promote quality improvement. N Engl J Med 363(7):683–688, pmid:20573915. (2010) Standards for basic anesthetic monitoring. http://www.asahq.org/For-Healthcare-Professionals/∼/media/For%20Members/documents/Standards%20Guidelines%20Stmts/Basic%20Anesthetic%20Monitoring%202011.ashx. Accessed January 13, 2011. (2008) Temperature monitoring and perioperative thermoregulation. Anesthesiology 109(2):318–338, pmid:18648241. (1989) Intraoperative temperature monitoring sites in infants and children and the effect of inspired gas warming on esophageal temperature. Anesth Analg 69(2):192–196, pmid:2764288. (1983) Precision and accuracy of intraoperative temperature monitoring. Anesth Analg 62(2):211–214, pmid:6829923. (1996) Thermal response in acute porcine malignant hyperthermia. Anesth Analg 82(4):782–789, pmid:8615498. (1992) The use of rectal temperature to monitor heat stroke. Mo Med 89(5):283–288, pmid:1608386. (1988) Does urinary catheter temperature reflect core temperature during cardiac surgery. Anesthesiology 69(6):986–989, pmid:3195774. (1997) Influence of thermoregulatory vasomotion and ambient temperature variation on the accuracy of core-temperature estimates by cutaneous liquid-crystal thermometers. Anesthesiology 86(3):603–612, pmid:9066326. (1996) Prior hypothermia attenuates malignant hyperthermia in susceptible swine. Anesth Analg 82(4):803–809, pmid:8615501. (2010) Clinical presentation, treatment, and complications of malignant hyperthermia in North America from 1987 to 2006. Anesth Analg 110(2):498–507, pmid:20081135. (2010) in Miller's Anesthesia. 7th ed, Temperature regulation and monitoring, eds Miller RD, Eriksson LI, Fleisher LA, Wiener-Kronish JP (Churchill Livingstone/Elsevier, Philadelphia), pp 1533–1536. (1995) Heat flow and distribution during induction of general anesthesia. Anesthesiology 82(3):662–673, pmid:7879935. (1984) Some characteristics of core temperature signals in the conscious goat. Am J Physiol 247(3 Pt 2):R456–R464, pmid:6476145. (2003) Blood pressure response to thermoregulatory vasoconstriction during isoflurane and desflurane anesthesia. Acta Anaesthesiol Scand 47(7):847–852, pmid:12859306. (1992) Intraoperative warming therapies: a comparison of three devices. J Clin Anesth 4(3):194–199, pmid:1610573. (1988) The thermoregulatory threshold in humans during nitrous oxide-fentanyl anesthesia. Anesthesiology 69(3):357–364, pmid:3415015. (1990) Shivering during epidural anesthesia. Anesthesiology 72(5):816–821, pmid:2339797. (1994) Thermoregulatory thresholds during epidural and spinal anesthesia. Anesthesiology 81(2):282–288, pmid:8053576. (1993) Thermoregulatory response thresholds during spinal anesthesia. Anesth Analg 77(4):721–726, pmid:8214655. (2001) Effects of epidural anesthesia on thermal sensation. Reg Anesth Pain Med 26(6):527–531, pmid:11707791. (1995) Propofol linearly reduces the vasoconstriction and shivering thresholds. Anesthesiology 82(5):1169–1180, pmid:7741292. (1995) Alfentanil slightly increases the sweating threshold and markedly reduces the vasoconstriction and shivering thresholds. Anesthesiology 83(2):293–299, pmid:7631951. (1997) Meperidine decreases the shivering threshold twice as much as the vasoconstriction threshold. Anesthesiology 86(5):1046–1054, pmid:9158353. (2009) ASPAN's evidence-based clinical practice guideline for the promotion of perioperative normothermia. J Perianesth Nurs 24(5):271–287, pmid:19853810, Erratum in: J Perianesth Nurs. 2010;25(2):111. (1998) Evidence-based practice and the role of nursing leadership. J Nurs Adm 28(7-8):45–53, pmid:9709696. (1996) Guidelines for perioperative cardiovascular evaluation for noncardiac surgery. Report of the American College of Cardiology/American Heart Association Task Force on Practice Guidelines (Committee on Perioperative Cardiovascular Evaluation for Noncardiac Surgery). J Am Coll Cardiol 27(4):910–948, pmid:8613622. Clinical practice guideline: The management of inadvertent perioperative hypothermia in adults. http://www.nice.org.uk/nicemedia/pdf/CG65Guidance.pdf. Accessed June 7, 2011. (1972) The effect of warming blankets on maintenance of body temperature of the anesthetized, paralyzed adult patient. Anesthesiology 36(4):408–411, pmid:5020650. (1968) Thermal burns caused by warming blankets in the operating room. Anesthesiology 29(1):149–150, pmid:5634556. (2003) Preliminary evaluation of the Arctic Sun temperature-controlling system during off-pump coronary artery bypass surgery. Ann Thorac Surg 75(4):1140–1144, pmid:12683552. (2004) Effects of a circulating-water garment and forced-air warming on body heat content and core temperature. Anesthesiology 100(5):1058–1064, pmid:15114200. (1992) A comfortable hypothesis reevaluated. Cerebral metabolic depression and brain protection during ischemia. Anesthesiology 76(2):161–164, pmid:1736691. (1998) Hypothermic modulation of cerebral ischemic injury during cardiopulmonary bypass in pigs. Anesthesiology 88(2):390–402, pmid:9477060. (2002) Treatment of comatose survivors of out-of-hospital cardiac arrest with induced hypothermia. N Engl J Med 346(8):557–563, pmid:11856794. (2002) Mild therapeutic hypothermia to improve the neurologic outcome after cardiac arrest. N Engl J Med 346(8):549–556, pmid:11856793, Erratum in: N Engl J Med. 2002;346(22):1756. (2005) Selective head cooling with mild systemic hypothermia after neonatal encephalopathy: multicentre randomised trial. Lancet 365(9460):663–670, pmid:15721471. (2005) National Institute of Child Health and Human Development Neonatal Research Network. Whole-body hypothermia for neonates with hypoxic-ischemic encephalopathy. N Engl J Med 353(15):1574–1584, pmid:16221780. (1994) Moderate hypothermia, with partial bypass and segmental sequential repair for thoracoabdominal aortic aneurysm. J Vasc Surg 19(4):687–697, pmid:8164285. (1999) Hypothermic cardiopulmonary bypass for spinal cord protection: rationale and clinical results. Ann Thorac Surg 67(6):1940–1942; discussion 1953-1958, pmid:10391344. (1992) Spinal cord stimulation evoked potentials during thoracoabdominal aortic aneurysm surgery. Anesthesiology 76(5):689–695, pmid:1575335. (1997) Clinical experience with epidural cooling for spinal cord protection during thoracic and thoracoabdominal aneurysm repair. J Vasc Surg 25(2):234–241; discussion 241-243, pmid:9052558. (1999) Spinal cord protection for thoracic aortic surgery. Cardiol Clin 17(4):807–813, x. Review, pmid:10589347. (1997) Treatment of traumatic brain injury with moderate hypothermia. N Engl J Med 336(8):540–546, pmid:9023090. (2001) Lack of effect of induction of hypothermia after acute brain injury. N Engl J Med 344(8):556–563, pmid:11207351. (2001) A multicenter prospective randomized controlled trial of the efficacy of mild hypothermia for severely head injured patients with low intracranial pressure. Mild Hypothermia Study Group in Japan. J Neurosurg 94(1):50–54, pmid:11147897. (2005) Mild intraoperative hypothermia during surgery for intracranial aneurysm. N Engl J Med 352(2):135–145, pmid:15647576. (1980) Effect of temperature on the chemotaxis, phagocytic engulfment, digestion and O2 consumption of human polymorphonuclear leukocytes. J Reticuloendothel Soc 27(6):561–565, pmid:7392012. (1996) Centrally and locally mediated thermoregulatory responses alter subcutaneous oxygen tension. Wound Repair Regen 4(3):339–345, pmid:17177730. (2001) Mild perioperative hypothermia and the risk of wound infection. Arch Med Res 32(3):227–231, pmid:11395189. (1989) Computer-aided surveillance of surgical infections and identification of risk factors. J Hosp Infect 13(1):1–18, pmid:2564012. (2004) Hospital costs associated with surgical complications: a report from the private-sector National Surgical Quality Improvement Program. J Am Coll Surg 199(4):531–537, pmid:15454134. Roundtable summary: perioperative temperature management. Anesthesiology News, http://www.anesthesiologynews.com. October 2005. Accessed December 21, 2007. (1995) The catecholamine, cortisol, and hemodynamic responses to mild perioperative hypothermia. A randomized clinical trial. Anesthesiology 82(1):83–93, pmid:7832339. (1993) Mild hypothermia does not impair postanesthetic recovery in infants and children. Anesth Analg 76(1):168–172, pmid:8418719. (1997) Mild intraoperative hypothermia prolongs postanesthetic recovery. Anesthesiology 87(6):1318–1323, pmid:9416715. (1995) Mild hypothermia alters propofol pharmacokinetics and increases the duration of action of atracurium. Anesth Analg 80(5):1007–1014, pmid:7726398. (1999) Effects of hypothermia (32°C) on plasma concentration of fentanyl in piglets (abstract). Anesthesiology 91(3A):A444. (1991) Mild intraoperative hypothermia increases duration of action and spontaneous recovery of vecuronium blockade during nitrous oxide-isoflurane anesthesia in humans. Anesthesiology 74(5):815–819, pmid:1673591. (1978) Hypothermia and the pharmacokinetics and pharmacodynamics of pancuronium in the cat. J Pharmacol Exp Ther 207(2):532–538, pmid:712635. (1987) MAC of I-653 in rats, including a test of the effect of body temperature and anesthetic duration. Anesth Analg 66(10):974–976, pmid:3631594. (1994) Coagulation defects resulting from ambient temperature-induced hypothermia. J Trauma 36(5):634–638, pmid:8189462. (1987) Hypothermia-induced reversible platelet dysfunction. Ann Surg 205(2):175–181, pmid:3813688. (1992) Effect of hypothermia on the coagulation cascade. Crit Care Med 20(10):1402–1405, pmid:1395660. (2008) The effects of mild perioperative hypothermia on blood loss and transfusion requirement. Anesthesiology 108(1):71–77, pmid:18156884. (1985) Changes in coagulation and fibrinolysis occurring in dogs during hypothermia. Thromb Res 37(4):503–512, pmid:3983906. (1968) Factors influencing arterial PO2 during recovery from anaesthesia. Br J Anaesth 40(6):398–407, pmid:4871803. (1987) Shivering following cardiac surgery: hemodynamic changes and reversal. J Cardiothorac Anesth 1(1):24–28, pmid:2979067, Erratum in: J Cardiothorac Anesth. 1987;1(5):following 501. 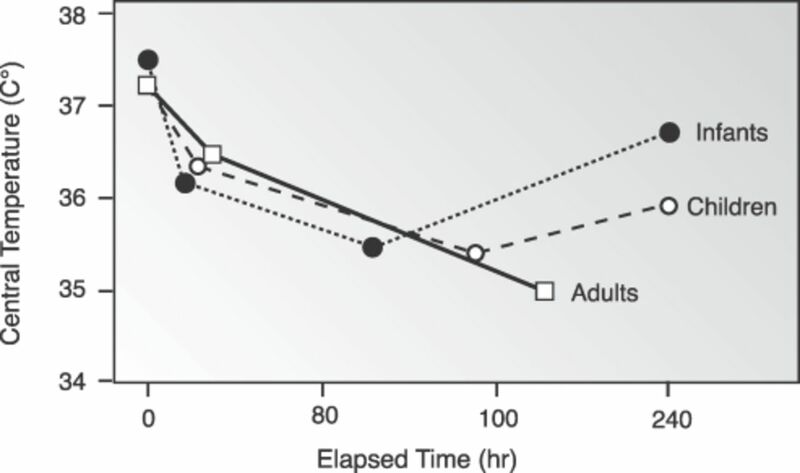 (1992) Oxygen uptake during recovery following naloxone. Relationship with intraoperative heat loss. Anesthesiology 76(1):60–64, pmid:1729937. (1995) Multivariate determinants of early postoperative oxygen consumption in elderly patients. Effects of shivering, body temperature, and gender. Anesthesiology 83(2):241–249, pmid:7631944. (1989) Effects of hypoxia on metabolic rate of conscious adult cats during cold exposure. J Appl Physiol 67(1):32–38, pmid:2759960. (1993) Unintentional hypothermia is associated with postoperative myocardial ischemia. The Perioperative Ischemia Randomized Anesthesia Trial Study Group. Anesthesiology 78(3):468–476, pmid:8457047. (2006) A systematic review of intraoperative warming to prevent postoperative complications. AORN J 83(5):1090–1104, 1107-1113, pmid:16722286. (1995) Morphometric influences on intraoperative core temperature changes. Anesth Analg 80(3):562–567, pmid:7864426. (2006) Effects of comfort warming on preoperative patients. AORN J 84(3):427–448, pmid:17004666. (2008) Hypothermia/warming protocols: why are they not widely used in the OR. AORN J 87(2):333–344, pmid:18262000. (2007) Efficacy of protocol implementation on incidence of wound infection in colorectal operations. J Am Coll Surg 205(3):432–438, pmid:17765159. (2009) New surgical thermal management guidelines. Lancet 374(9695):1049–1050, pmid:19782858. (2009) NICE guidelines for inadvertent peri-operative hypothermia. Anaesthesia 64(12):1381–1382, pmid:20092528. (2004) Mild hypothermia, blood loss and complications in elective spinal surgery. Spine J 4(2):130–137, pmid:15016389. (2010) Normothermia to prevent surgical site infections after gastrointestinal surgery: holy grail or false idol. Ann Surg 252(4):696–704, pmid:20881777. Get warmed up for SCIP-INF-10. http://www.info-haiwatch.com/20090918/kc20090918_landing_scip.html. Accessed January 13, 2011. (1995) Halothane selectively inhibits nonshivering thermogenesis. Possible implications for thermoregulation during anesthesia of infants. Anesthesiology 82(2):491–501, pmid:7856907. (1971) The cardiovascular effects of a new inhalation anesthetic, Forane, in human volunteers at constant arterial carbon dioxide tension. Anesthesiology 35(1):8–16, pmid:4932622. (2005) Miller's Anesthesia. 6th ed (Elsevier Churchill Livingstone, Philadelphia), p 2369. (1993) Thermoregulation and paediatric anaesthesia. Curr Opin Anaesthesiol 6(3):537–542. (2001) in A Practice of Anesthesia for Infants and Children, Temperature regulation: normal and abnormal (malignant hyperthermia), eds Cotes CJ, Todres D, Ryan JF, Goudsouzian NG (W.B. Saunders, Philadelphia), p 613. (1966) Chemical thermogenesis in newborn infants: catecholamine excretion and the plasma non-esterified fatty acid response to cold exposure. Pediatrics 37(4):577–582, pmid:5930019. (2005) in Avery's Neonatology. 6th ed, Thermal regulation, eds McDonald MG, Seshia MMK, Mullett MD (Lippincott Williams & Wilkins, Philadelphia). (1985) Regional heat loss in newborn infants. Part I. Heat loss in healthy newborns at various environmental temperatures. S Afr Med J 68(13):940–944, pmid:4081928. (1983) Reduction of neonatal heat loss by an insulated head cover. J Pediatr Surg 18(6):909–913, pmid:6663422. (1981) Head insulation and heat loss in the newborn. Arch Dis Child 56(7):530–534, pmid:7271287.